His Holiness the Dalai Lama is 78 today. Regarded by many as an emanation of Avalokiteshvara, the Buddha of Compassion, here is a summary of the Dalai Lama’s mission in the world from the website of the Gyuto Vajrayana Center in San Jose. Firstly, on the level of a human being, His Holiness’ first commitment is the promotion of human values such as compassion, forgiveness, tolerance, contentment and self-discipline. All human beings are the same. We all want happiness and do not want suffering. Even people who do not believe in religion recognize the importance of these human values in making their life happier. 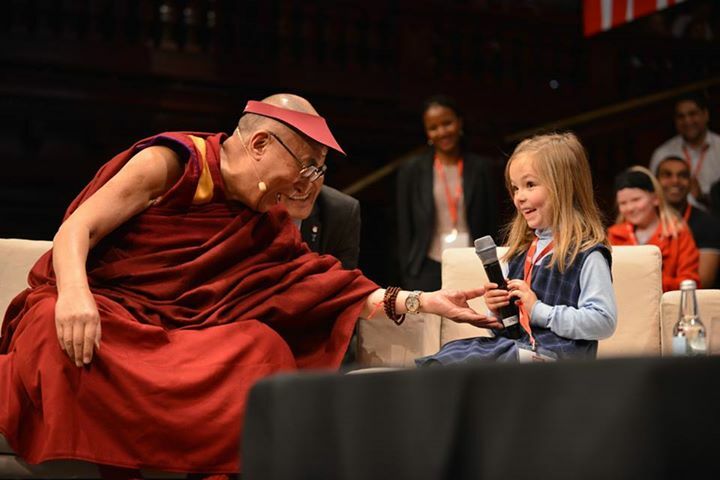 His Holiness refers to these human values as secular ethics. He remains committed to talk about the importance of these human values and share them with everyone he meets. Thirdly, His Holiness is a Tibetan and carries the name of the ‘Dalai Lama’. Therefore, his third commitment is to work to preserve Tibet’s Buddhist culture, a culture of peace and non-violence. This entry was posted in Buddhism, Current Events, Spirituality and tagged Buddhism, Culture, Dalai Lama, Events, spirituality. Bookmark the permalink. One of the bywords that I see frequently on his Facebook page is ‘compassion’, a virtue that you don’t need religion for and one I absolutely subscribe to. One of my daughters happened to be in the Himalayan foothills over a decade ago. Not being au fait with Buddhism she still decided it would be interesting to trek up to a village to meet the Dalai Lama on his birthday. The moment when he accepted her offering made the long wait in line well worth it: when he looked into her eyes she felt that this was a significant moment in her life, that in that fleeting moment he had given her his total and absolute attention, that all that mattered to him just then was her as fellow human being. It took a special person to impress the wild child that she was then.